The Kawasaki ZZR1400, known in America as the "ZX-14", is known as the world"s most powerful sports motorcycle. The ZX-14, commonly known as the "Ninja", features a tandem seat and under diffuser. 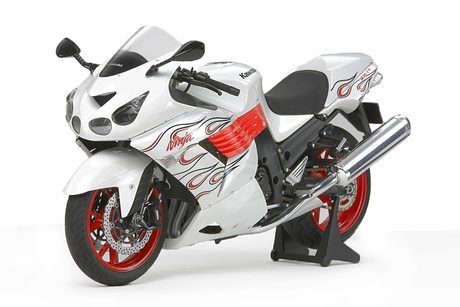 The fire racing pattern was produced on the ZX-14 for the American market. Special Feature 3 The 6 front lights have been realistically reproduced capturing the aggressive form. Special Feature 4 The compact 1352cc four-stroke, DOHC, water-cooled inline four cylinder engine has been precisely rendered. Special Feature 5 Brake and accelerator cables are realistically depicted with vinyl tubing, improving realism. Special Feature 6 Synthetic rubber tires provide the model with a sharp, realistic finish.